GMO- Free, Wild Crafted, You can buy Organic Fennel Pollen, Organic Dill Pollen, Black Fennel Seed, Fennel Spice Blends, Fennel Pollen Ingredients, Dill Pollen Ingredients, You can buy Dill Pollen as well. We have a great variety of fennel pollen spices and Dill Pollen. Wonderful additions to many types of dishes. We even carry a desert blend! You can't go wrong. We love them all. 1 oz. Big Devil Seasoning: This blend can be added to literally any dish you can imagine a little warmth or high heat on. Use as a dry rub on meats, add to BBQ sauces,sprinkle a small amount on eggs and even put a little in your Bloody Mary drink. For added heat put some on after cooking. We love Big Devilin chili beans and on pork or beef ribs. 0.5 oz Dill Pollen: Use this wild crafted dill pollen anywhere you would use ground orpowdered dill for a difference you’ll have to taste to believe. 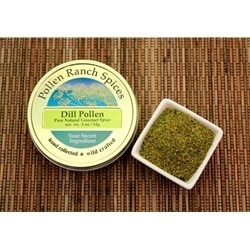 Use dill pollen in any recipe that calls for dill stalk or seeds. 1 oz. Divine Desserts is a wonderful fennel pollen spice blend created by Chef' Bernard Guillas. This is a vibrant aromatic blend of 12 unique spices and fennel pollen. Enhancing the flavors of fresh fruit, apple pie, carrot cake and cookies.With this gourmet spice blend you can feel free to be creative. Replaces cinnamon in any recipe. 1 oz. Hog Heaven our pork and chicken will never be the same when they’re encrusted in this warm and toasty herb and seasoning blend. Crushed pecans give a nutty flavor and cumin adds a touch of savory smoke that goes perfectly with any pork or poultry dish. Light citrus tones brighten and balance the flavor of this warmly aromatic blend. Add a dash to your chicken and dumplings to add depth or roll pork tenderloin in it before roasting for a mellow spiciness that compliments the tender pork exquisitely.Nutty, flavorful and delectable, this will be your "go to" seasoning for poultry or pork. 1 oz. Zen-Sational! You will become addicted to vegetables once you taste the favor of Zen.As you open this blend, you immediately notice a warm and nutty aroma from the toasted sesame seeds and curry. This enticing blend makes your veggies delicious and it’s a great seasoning when you want to add zip to salad dressing. A touch of spice from the hint of cayenne that balances this lively spice blend and you’ll notice notes of citrus and ginger when you sprinkle it on your side dishes. Sprinkle this on everything from eggs to rice to veggies and salads then say good bye to bland and boring side dishes forever!